The rugged landscape of the Superstition Mountains is not easily conquered. 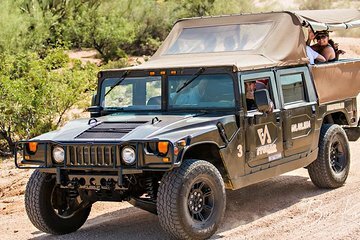 Accessing the dry, cactus-laden desert trails is no problem - if you’re riding in a Hummer H1. This extreme adventure gives you a serious adrenalin rush as your guide hurtles you down the Bulldog Canyon trail, enjoying the unspoiled beauty of the desert backcountry. I am giving this 4 stars instead of 5 because Viator does not have an accurate description of the tour. This was more like a nature ride through the desert; it was not exhilarating as we thought. Our guide was very nice and taught us many things about cactus, etc. Viator needs to update the description.